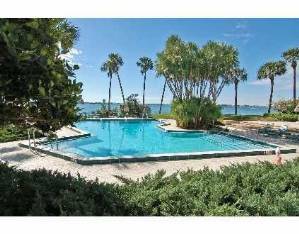 Waterfront luxury accommodations with breath taking views of Sarasota Bay, the Gulf of Mexico, Siesta Key, Lido Key, Longboat Key and downtown Sarasota. Enjoy unforgettable sunsets from the spacious 12th floor balcony as you recall the day and plan tomorrow. Conveniently located adjacent to the Hyatt Hotel and the Ritz Carlton Hotel and a short walk to Sarasota’s downtown – with its quaint shops and marvelous dining, Cultural district – with its theaters, cinemas, opera house and performance arts center (Westcoast Symphony and Sarasota Ballet), and the marina – with its restaurants, park, fishing and boat rentals. For the more adventurous, walk a bit further across the beautiful Ringling Bridge to St. Armand's Circle with its superb shops, galleries, sophisticated restaurants and nightlife. Just beyond is the crystal white sand of Lido Beach on the Gulf of Mexico. 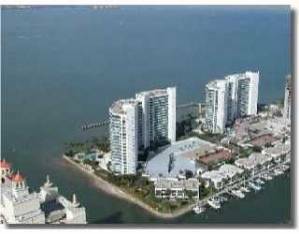 The designer 2 bedroom/2 bath condominium contains 1600 sq. ft (149 sq. m) of spacious living area featuring a large master bedroom suite (with the same views as the balcony) with a queen bed, closets and full bath with 2 wash basins. The large living/dining area is separated by a large black leather sectional couch, that also faces the entertainment unit, and the dining area’s glass topped table comfortably seats six. The roomy kitchen is equipped with side-by-side refrigerator, dishwasher, garbage disposal, ceramic cook top, convection oven, microwave oven and the dinette area that seats four - also contains the laundry closet with stacked full size washer and dryer. The comfortable second bedroom has a queen size sofa bed and the second full bath is just outside its door. The unit’s amenities include: Cable TV (4), VCR, DVD, CD deck, AM/FM, Surround Sound, DSL, computer, and telephone. The unit is provided turnkey, complete with linen, dishes, etc. 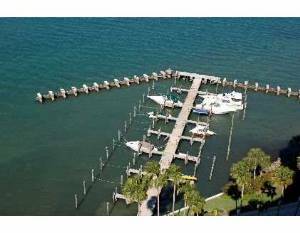 The beautifully landscaped bay front Condominium on the Bay development features the following amenities: two heated swimming pools, exercise rooms, sauna, 2 tennis courts, two docks/fishing piers, concierge, 24 hr. security, gated entrance, parking, elevators, and social room. 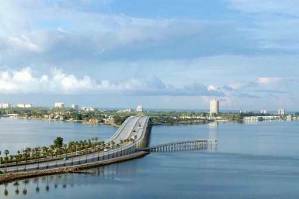 It is located just 4 miles from the Sarasota airport and the Tampa airport is only one hour away. All of the gems of Sarasota are only minutes away! 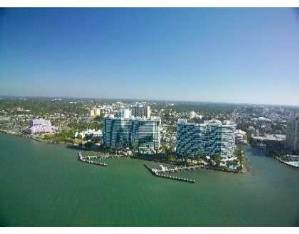 Besides the previously mentioned Lido Beach, Siesta Key Beach, the beaches of Longboat Key and the many other great beach spots located on the sunny Gulf coast are close by. Visit Mote Marine, South Lido Park - a fun-sun spot to explore nature trails, canoe, kayak, and picnic. Choose from a multitude of public golf courses in Sarasota. Venture off to the sights and attractions of Tampa Bay (1 hr), Orlando (2 hr), Naples (2 hr) or Miami (4 hr). Car rental at excellent rate. Internet is DSL High Speed. 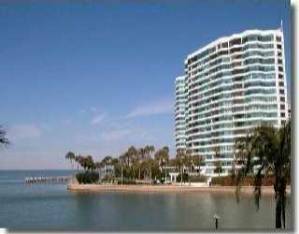 Sarasota is Florida's Cultural Center and this condo is located in it's center. Special access to excellent tickets to most events. I haven't been at your location but my wife and I, both over our 50;s are looking for a condo from around May 24, 2011 to 5 June, 2011. I you do not have one available, could you put me on to someone tht can assist. Cancellations and Refunds: 50% cancellation fee prior to final payment. No refund after final payment made. Cancellation insurance is available.